Well last Sunday I stuck two fingers up to the drudgery and the tipping winter rain: "I'm getting my OOTD photos taken, if it's the last thing I do!" and yes, there was a lot of fist-shaking and witch-like cackling immediately afterwards. Because I will not be defeated by the season of good will and bad weather. 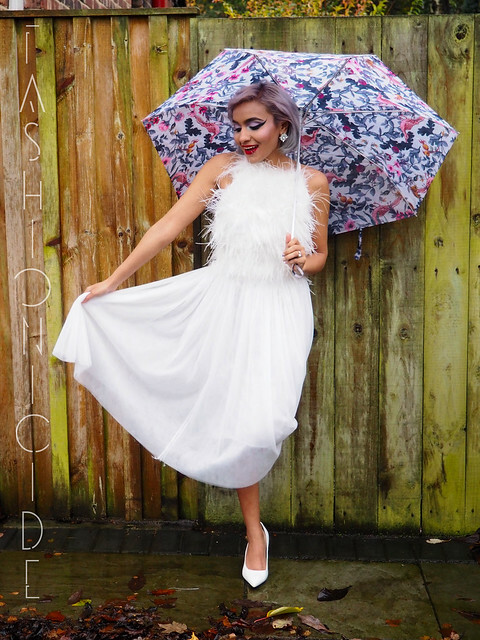 Those of you with good memories might recall a 'White-on-White' look I did way back in January of this year, where during a break in the rain, I snuck out in to the back garden with an awesome white furry bomber jacket and Bodycon dress. If not, the post is here. And this post is like a part two of that one. 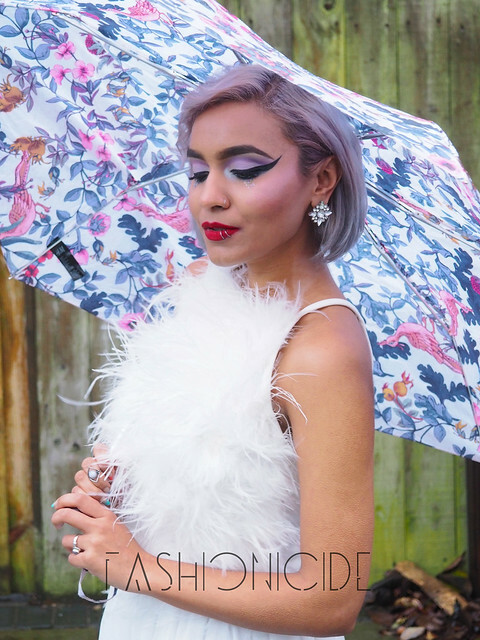 But this time I'm wearing a white feathery halterneck coupled with a white tulle skirt, and this time there was no break in the rain, hence my slightly broken H&M umbrella! "Has anyone seen my other leg?" The Feathered Halterneck gave me Goosebumps... Or was it the cold? Tulle skirts have been on my 'must-buy' list for a year or so, having seen countless examples on eBay. But for whatever reason, I'd always add them to my watchlist, and then never follow it up - even Buy it Nows! But the other week I saw a trio of beautiful skirts - one white, another mint and the final one pink - I thought "Sort yourself out Lima, we're f**king buying them". And that was that, no watchlist, just a straight 'Buy it Now', and at around £6 each, I have to say it would have been rude of me not to! The only downside really is that they came all the way from China, so there was a couple of week's waiting time, but arrive they did, and vacuum packed too so I had absolutely no idea what I'd been sent until the package was torn open. 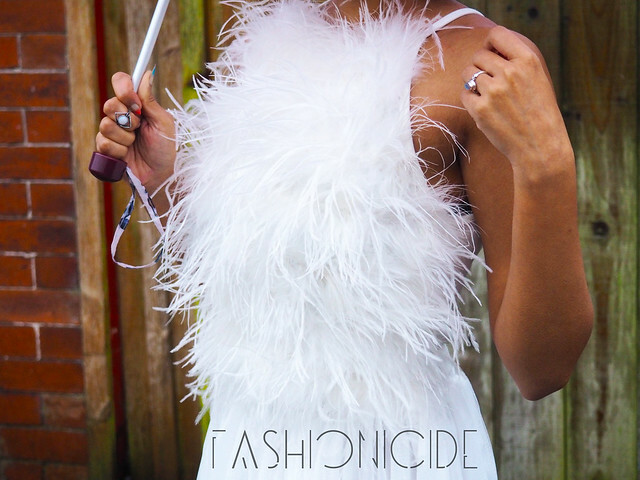 The feather halterneck was purchased from Missguided a couple of weeks back too, where I also bought a black feather bardot croptop. And yes, there is a theme here, don't you just find that feathered garments look so cosy and warm, as well as classy and luxurious? It's odd how one garment can make you feel like both a polar bear and some kind of iconic actress at the same time. Maybe that's just me though. 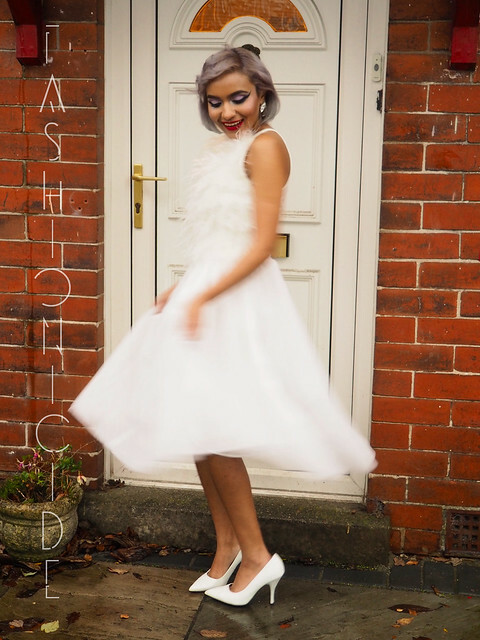 Either way, the white tulle skirt goes perfectly well with the white feather halterneck and managed to brighten up a particularly dull, wet November Sunday afternoon. What more could you ask for? I love this combo, been after a tule skirt for a while but that top makes it so much more dramatic! This is gorgeous! Loving your top :)) Great post and yay to you for battling the cold! How cute is this!! !your makeup is on point and I would so wear this as wedding wear!